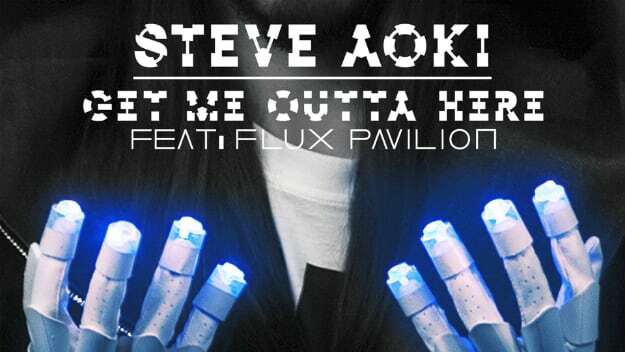 Steve Aoki & Flux Pavilion - "Get Me Outta Here"
Though his label Dim Mak has had terrific top-40 success with The Chainsmokers&apos; "#SELFIE" in the first half of 2014, Steve Aoki has been name that was absent from many EDM conversations early in the year, but is certainly picking up the slack in the second half. Aoki&apos;s artist album Neon Future I is due on September 30th (on Dim Mak/Ultra Music), and with latest single "Get Me Outta Here," Aoki continues to re-enters conversations with a bass-heavy smash featuring UK low-end icon Flux Pavilion. Starting off with a snare, kickdrum, lone synth line, and atmospherics, the song builds to a feverish and much louder crescendo built on a now-racing synth and a furious, stabbing bassline. With a vocal tossed in for good measure, it&apos;s an anthemic, headliner-set production worthy of inclusion in not just the sets of the producers responsible for the production, but others erring in this stylistic direction. If looking to find Aoki on September 30, look no further than ABC&apos;s Jimmy Kimmel Live, where Aoki will perform another released album single, "Rage The Night Away," alongside Waka Flocka. Truly a top-tier affair, Aoki&apos;s second studio album features Fall Out Boy, Empire of the Sun, will.i.am, Afrojack, and Bonnie McKee, and rappers Machine Gun Kelly and the aforementioned Flame. The Kimmel performance falls in the midst of a few Aoki fall festival, club and arena dates listed below.